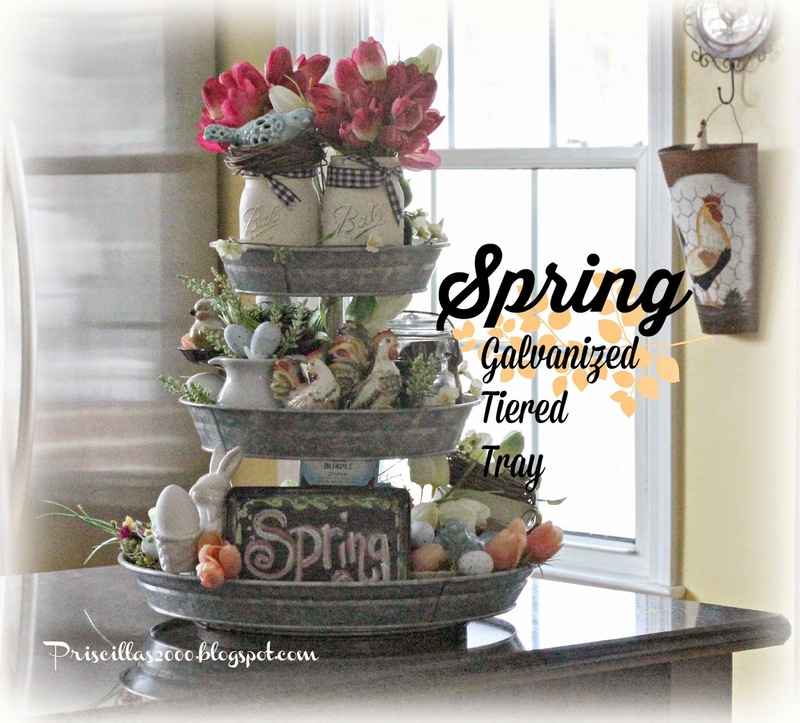 It's time for the spring version of the galvanized tiered tray that came from Sam's club last May!! 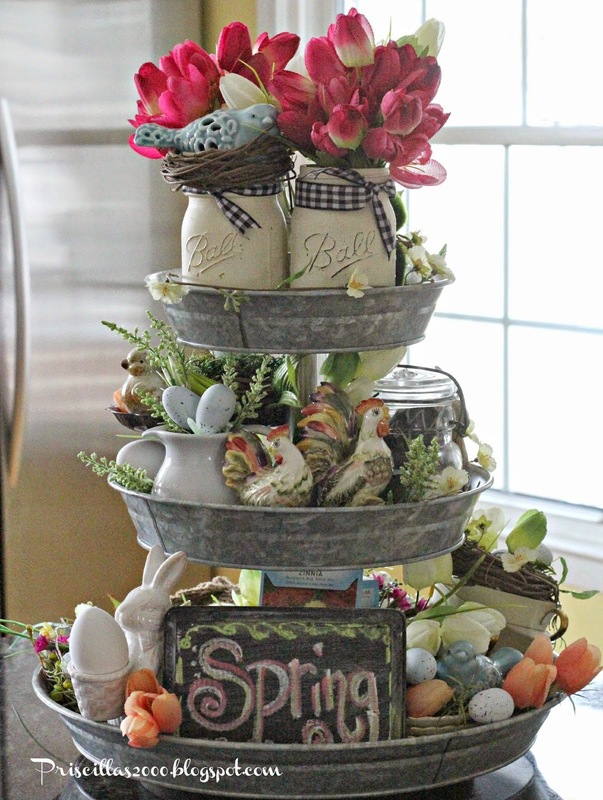 Lots of eggs, birds, nests, bunnies and tulips fill the 3 tiers.. 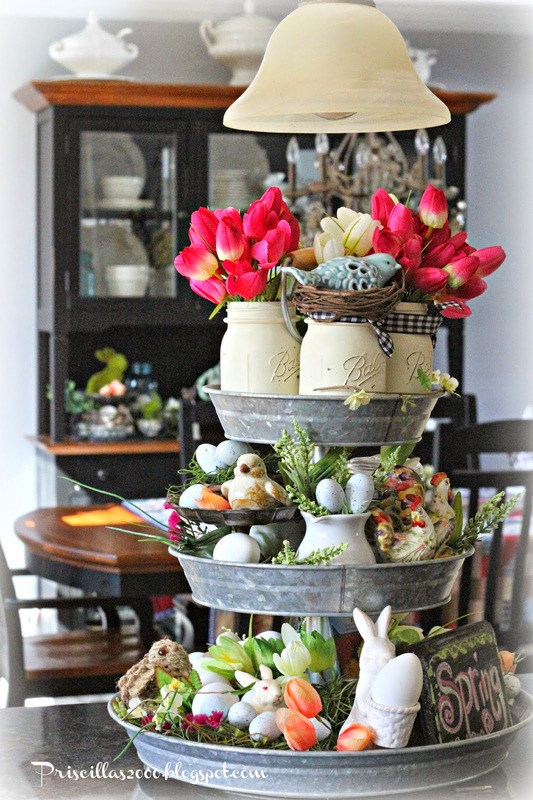 The top layer has 3 chalk painted mason jars filled with tulips and a moss bunny.. 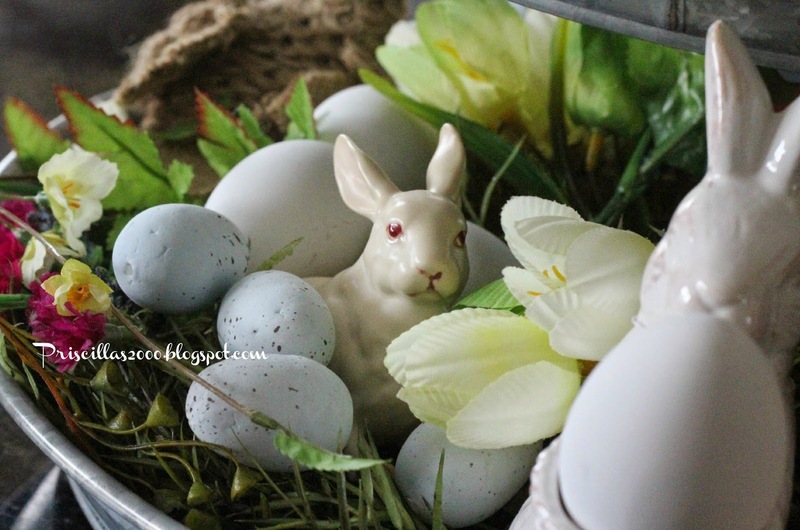 This little white bunny egg holder is from Walmart.. 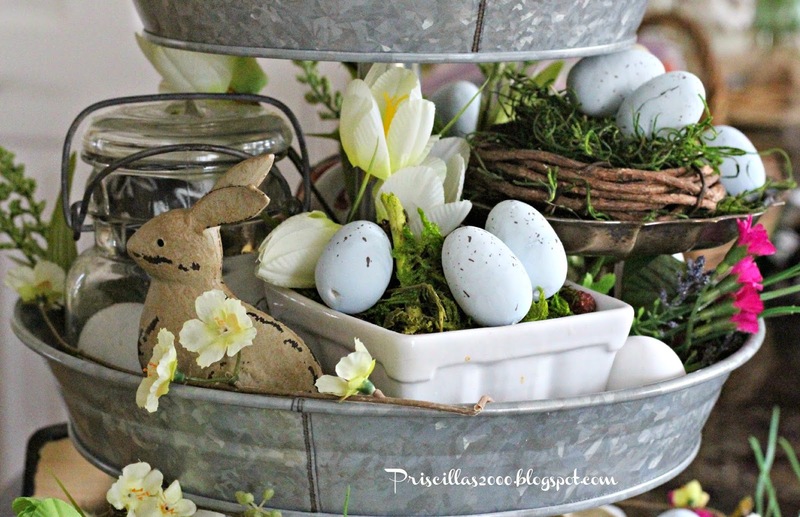 This little bunny was bought at a church rummage sale last year ..
a white berry basket that was a gift from my sister in law is filled with moss eggs and tulips. 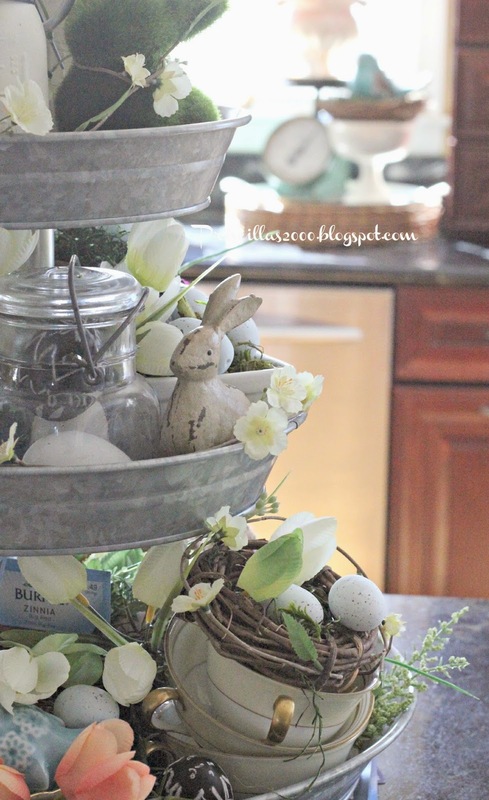 I will be showing you the rest of the kitchen decorated for spring soon..
little grapevine wreaths make great nests.. I have the tray on the counter in the kitchen instead of the table.. I might move it back to the table .. Doesn't it just look like 3 layers of spring ? Have a wonderful day and thanks so much for stopping by! You have out done yourself on this one!! LOVE!!!!!!! How you decorated this piece!! I can not believe that i missed this in Sam's Club last year and i am kicking myself about it BIG TIME!! I love how you decorate it for every season but this one just touched my heart!! 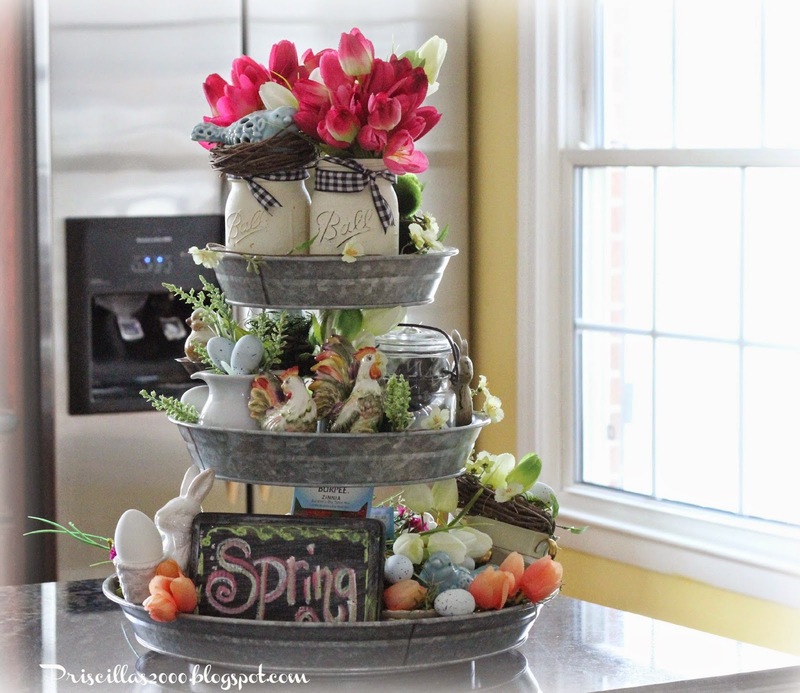 So perfectly perfect and springish and I was just thinking before I spied your blog post here that this weekend is THE weekend I'm decorating for spring! It looks so lovely, wished I had one now. I think this is my favorite tier decoration that you have done so far - but they are all gorgeous!!! I'm just very anxious for spring!! Where did you get your tulips, do you recall? I'm having a heck of time finding any that are closed up!! Can't wait to see the rest!! I just love that tray. It really speaks of Spring. 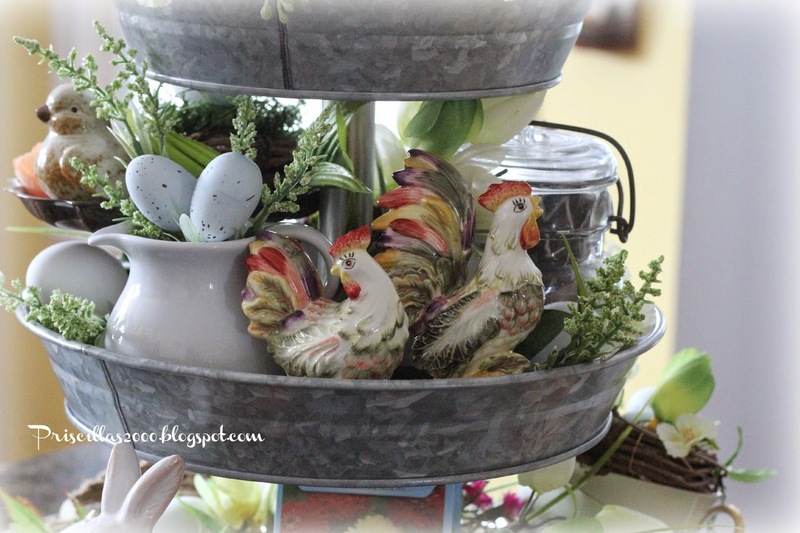 Priscilla, I have been looking on Pinterest for a Spring idea to decorate my galvanized tiered centerpiece I ordered from Pottery Barn! I cannot believe you got yours at Sam's Club!!! Do you use Spanish moss, raffia, or greenery as a filler in the base on each tier to raise the level of your displays? Did you just spray paint the Mason jars with what kind of paint? I absolutely love it!!! Your spring decoration is very joyful and beautiful! I have a very similar bunny! I absolutely love this! I am so ready for spring it is not even funny. We have piles upon piles of snow here and I am tired of it. It doesn't seem like winter is ever coming to an end. Your display made me smile! Visiting from Pieced Pastimes! If you have a free moment, we'd love for you to show it off at #FoodieFriDIY as well...our party is still open until midnight Sunday. Sharing regardless though...it's wonderful! Very cute! 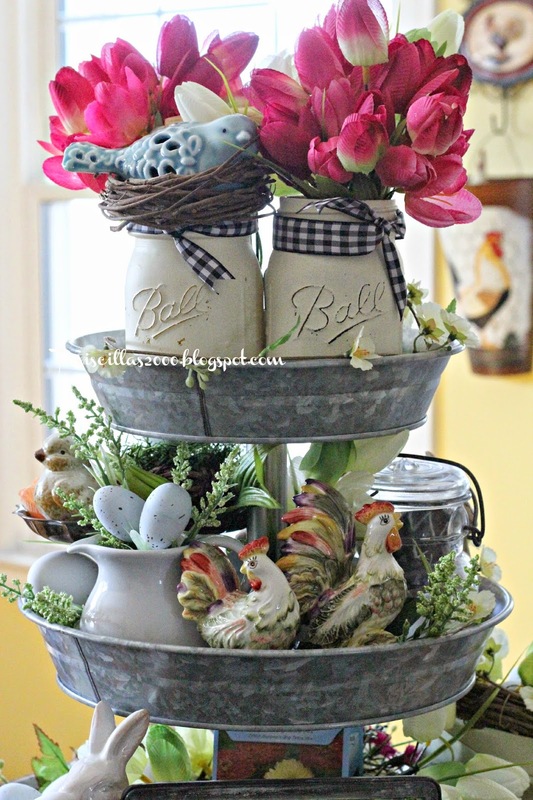 Especially love the jar/vase collection at the top. I would love for you to stop by my blog and join our link party Something to Talk About! Love it! Reminds me of my favorite town... Julian, CA. Lots of shops filled with this style of amazing things! 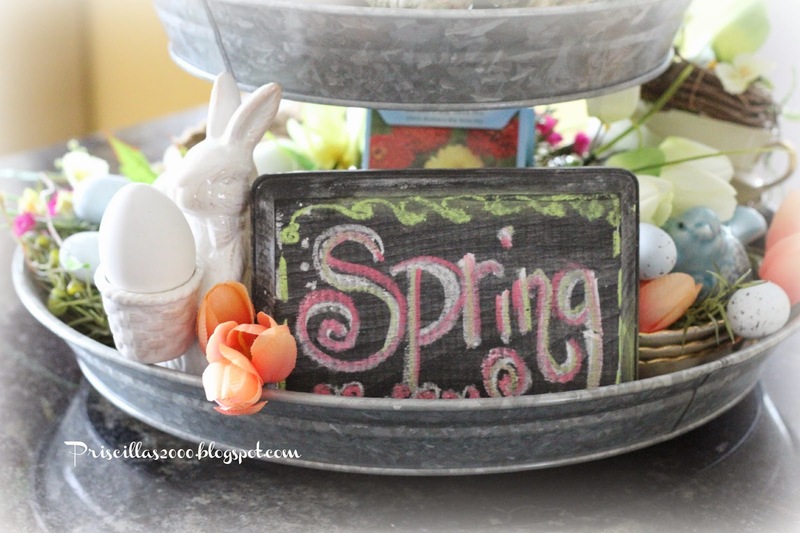 Love your tray and all those spring touches, super cute! 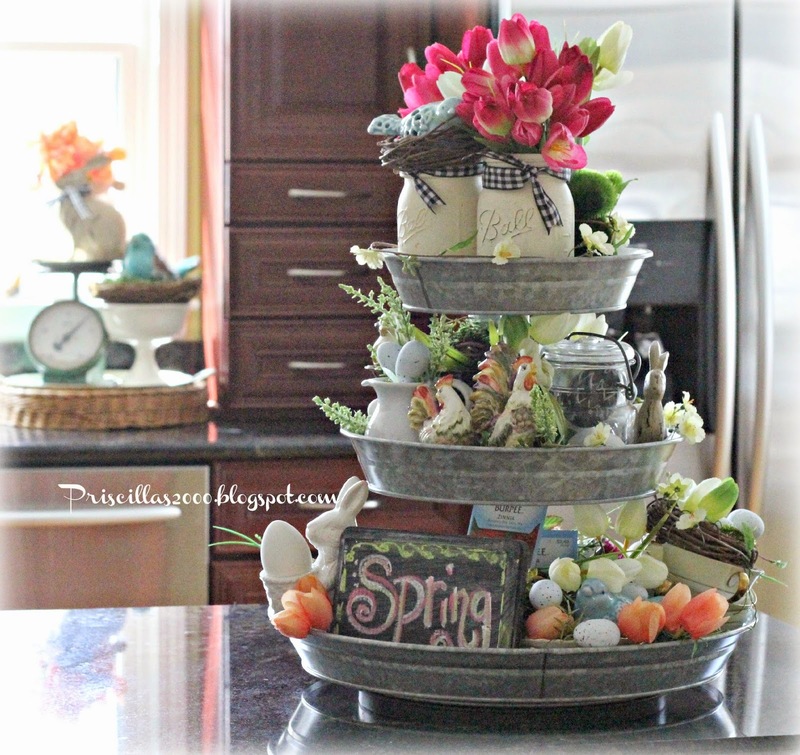 Priscilla, I love this centerpiece! I've chosen it as one of the features at today's Shabbilicious Friday party! You can find it here: http://anastasiavintagehome.blogspot.com/2015/03/shabbilicious-friday-link-party_12.html. I have loved this piece from day one Priscilla. You style it so beautifully for every occasion! Love it all decked out for Spring! Thanks for sharing with SYC. So pretty Pricilla! And yay for spring! Saw your feature at Brenda's Cozy Little House. 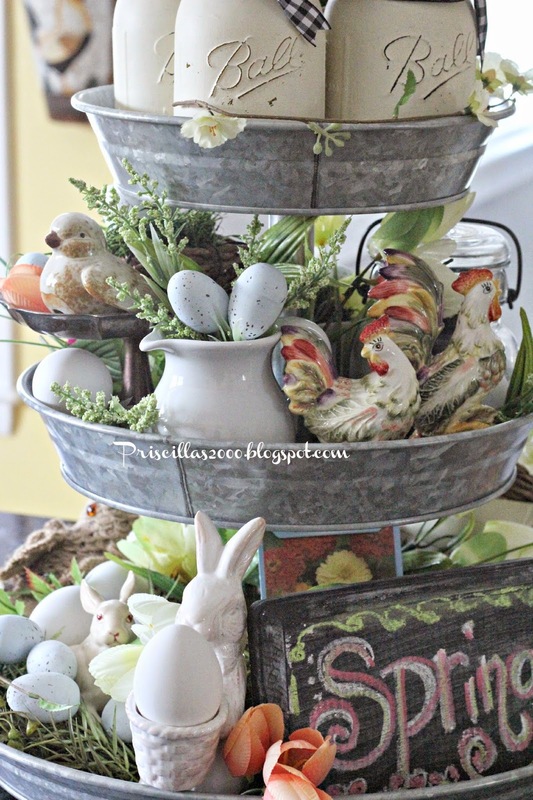 This Easter/spring decoration of your three-tier is absolutely gorgeous. Amazing. Can't say enough good about it, I just totally love it. 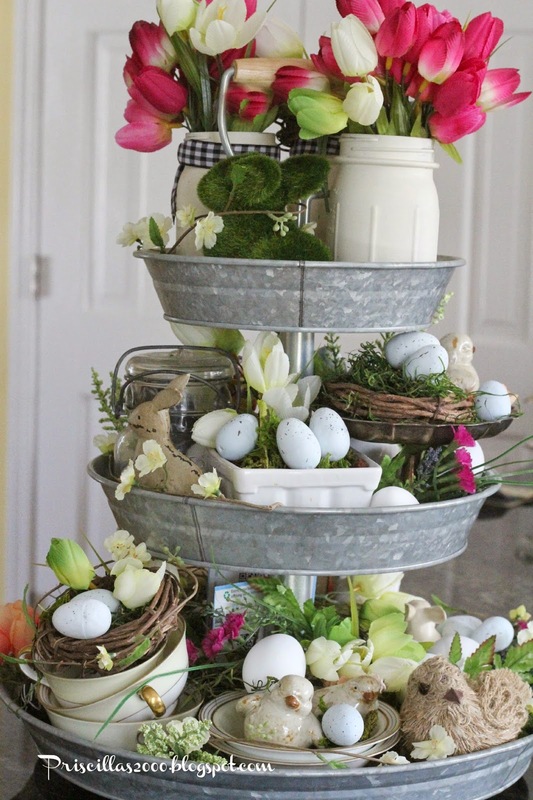 Now to get out my three-tier and get it ready for spring - mine's not as big as yours and is all glass, it was my Mom's from back in the day - but it decorates nicely. Thanks for the inspiration. Always love seeing what you do with your tray. Thank you for sharing at THT! 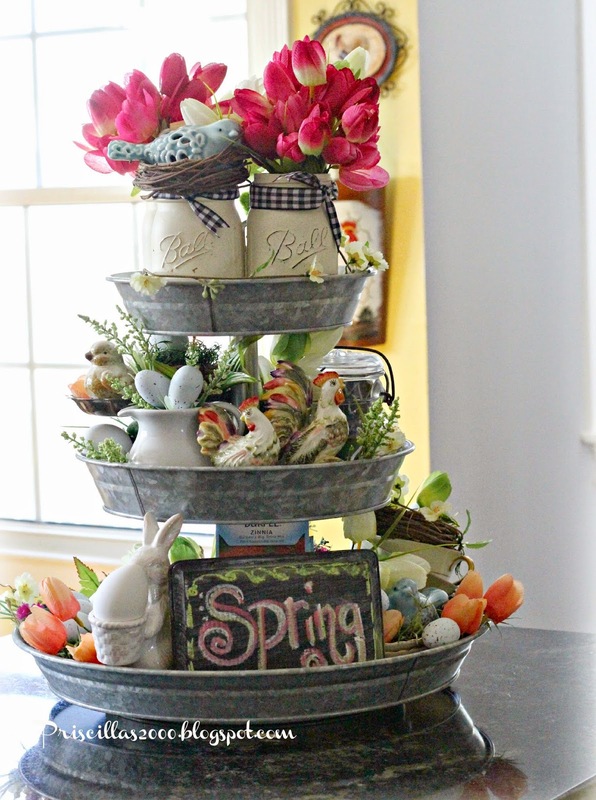 Love your Spring centerpiece...it's so pretty! Love, love, love the tray piece! !